Assam comprises of both tribal and non-tribal populations. The Assamese tribes include the Boro-Kachari, Mishing, Mech, Lalung, Chutiya, Dimasa Cachari, and Karbi Anglong. Just as the bamboo craft was once a male domain in Assam, textiles were exclusively a female occupation. This pattern is still followed, in many parts of Assam. For domestic consumption a throw-shuttle loom is used in the non-tribal lowlands. Commercial weaving is done on fly-shuttle looms with the aid of a jacquard device. Hand-woven fabrics from Assam are in cotton, muga and pat (mulberry silk), and eri (endi). Muga has a natural golden sheen; eri is a mildly warm silk, particularly suitable for winter. Muga silk was once used together with zari to weave fabrics for royalty, but today the zari has been replaced by multicoloured cotton threads. Cotton decorative textiles include bedspreads, furnishing material, mekhala, chaddars, shawls, and saris. The lasingphee produced by weavers of Cachar district is extraordinarily warm and soft. It is woven by using colourful staple yarn as warp, with cotton or bamboo inserted between the wefts for warmth. Assamese weavers produce beautiful designs on the borders of their mekhlas, chaddars, rihas (traditional garments used by the women), and gamosas (towels). Designs are mostly stylised symbols of animals, human figures, flowers, birds, diamonds, cross borders, and the galaxy. The designs in Assam, as in other parts of India, are symbolic of the different tribes and ethnic groups of the area. Rajampai aareu is a tribal fabric from Assam on which the tribal designs are done in striking colours. Women weavers work from a graph of small designs. Kumbung, which means chaddar in the Rabha language, is a traditional Rabha dress. 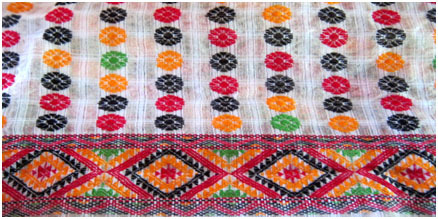 This is used, by the Rabha women, like a shawl, draped over the shoulder as an accessory to the sarong or kocha lufung. The designs are geometric, mainly squares, embellished with floral tracery in between coloured strips. It is woven on a loin-loom with traditional colours. The traditional Rabha muffler is woven on fly- shuttle looms with traditional colours. 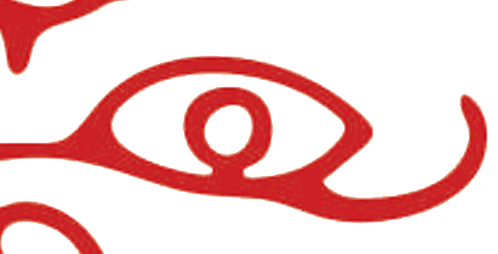 Rabha designs are noted for exceptionally fine patterns. The Bodo tribes of Assam are from the plains and their women wear a traditional dhakana, a fabric wrapped around the body with only the shoulders exposed. The dhakana is very much like a sari and has a border running along its edges. It is customary in Assamese society for a young woman to make a present of a self-woven bihuan (gamosa or towel) to her beloved as a token of love, and to elders as a symbol of respect, on Bohag Bihu (New Year’s Eve). These towels are white with patterns at both ends with stylised forms of birds, animals, humans, flowers, foliage, and geometric motifs. The Assamese men carry this gamosa, which is woven in fine cotton in plain weave. The tribal mirijim work is commonly done on blankets, mattresses, and floor coverings in honour of guests and visiting dignitaries. The work done by the women of the Miri tribal community is known for its great beauty, excellence of traditional designs and durability.